Grease square baking pan and line with parchment paper. Beat eggs until very light. Beat in sugar, water and vanilla. Sift flour, baking powder and salt and beat quickly into mixture. Immediately pour into pan. Peel away parchment paper, and cool completely. Slice cake horizontally into two layers. Spread a layer of whipped topping over the bottom layer. Arrange strawberry slices evenly over the whipped topping. 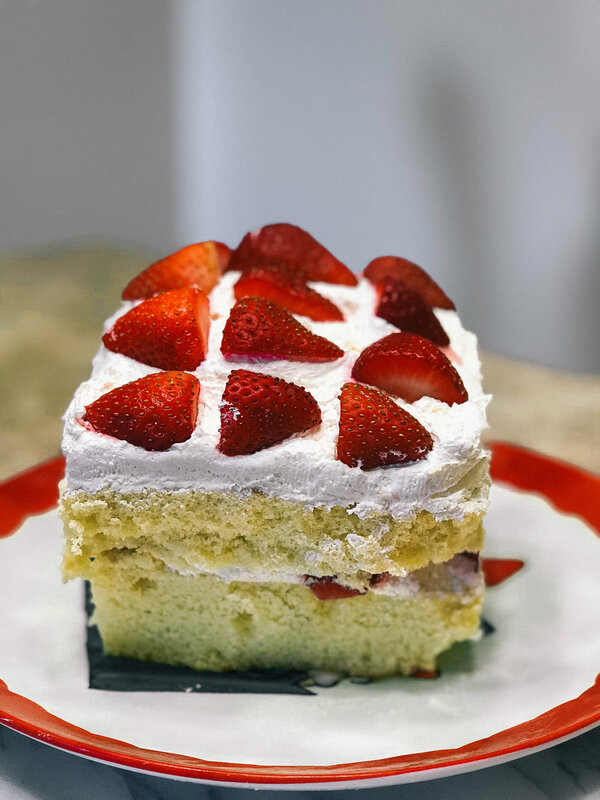 Place the top layer over the whipped topping and strawberries. Place in the fridge to solidify. In a bowl, beat the cream cheese, powdered sugar, and vanilla until smooth. Fold whipped topping into the cream cheese mixture. Spread across top of the cake. Place sliced strawberries as desired. *Original recipe from Sugar Apron, with modifications by me.